Well, the past month feels like a whole year. I’ve experienced the full range of emotions and although I’m still processing it all, I feel steadier, though also humbled and more gentle through it. I’ve been reminded of the blessing of family, the fragility of life, and the importance of health and honoring my body and my great wish to inspire others to do the same. I’ve realized that cooking and food crafting is where I find my stability, my constant, my place. Home is where my food is and I’m so grateful for the choice and opportunity that I have. 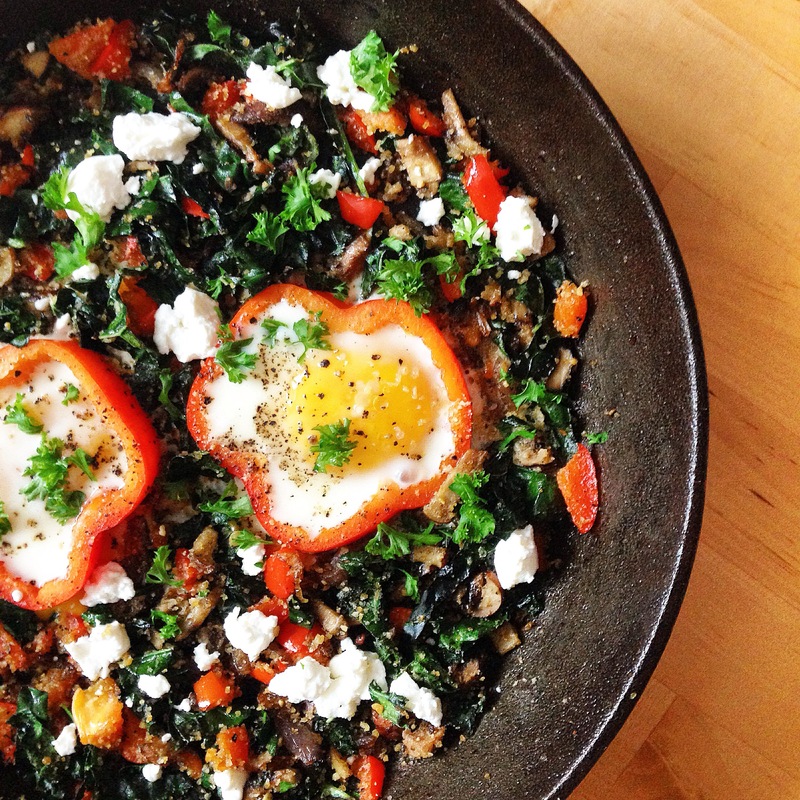 I pulled inspiration for this skillet from the idea of a stuffed red pepper and egg-in-a-hole. It’s like deconstructed stuffed red pepper (unstuffed red pepper? 🙂 ) with an egg. The red pepper cut-out makes for a fun presentation and this skillet takes no time at all. A healthy, tasty, vegetarian meal suitable for breakfast, lunch or dinner. Dice the onions and mushrooms and saute in the cast iron pan over medium-low heat in 1 Tbsp of coconut oil. Slice the red pepper across the middle at it’s widest point all the way through to create the circle cut-outs. You’ll want the width of circular strips to be about half an inch wide. Dice the rest of the pepper that you are not using for the cut-outs and toss them into the pan with the onions and mushrooms. Sprinkle the gluten-free breadcrumbs over the sauteing veggie mixture as well as some salt and pepper and stir to blend evenly. Cut the kale into small strips or pieces (I always remove the tough kale stems). Add to the kale to the sauteing mix, stir and remove from heat immediately. Create wells in the sauteed mixture for the red pepper cut-outs. Add more coconut oil if the pan is looking a bit dry. 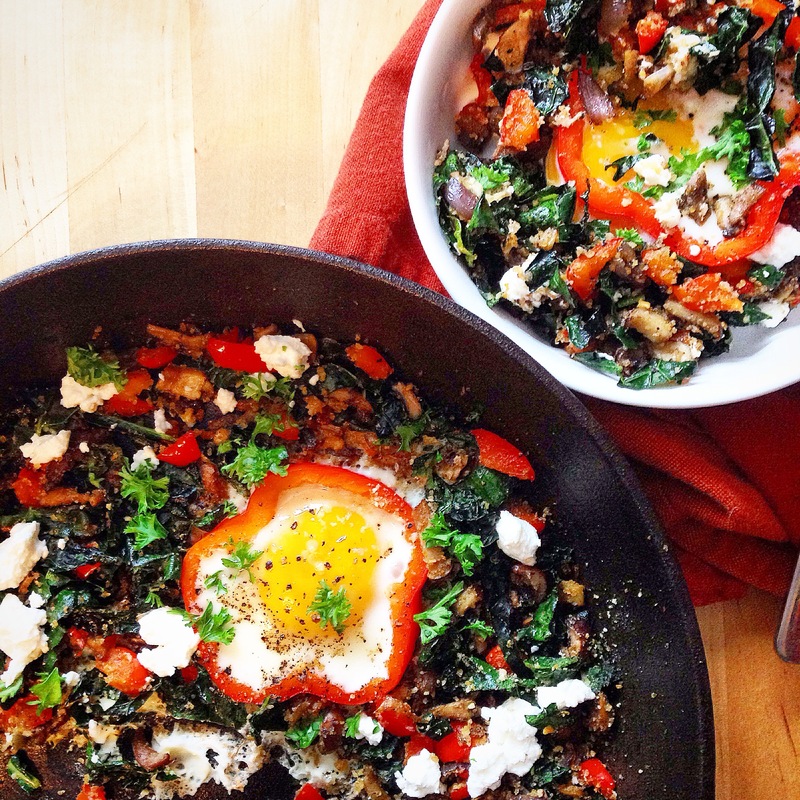 Place the red pepper cut-outs into the pan and gently crack one egg into each. Sprinkle all with salt and pepper and put the skillet into the oven. Bake for about 6 – 8 minutes, watching carefully not to overcook and dry-out the eggs we want to remove it just when the whites become cooked. Remove the skillet from the oven. Crumble on the feta cheese over the top, sprinkle with chopped parsley, a bit more salt & pepper. Serve directly from the skillet and enjoy your day. Remember to chew well and take the time to taste your food – we are blessed.